Lately, I’ve been hearing a lot of confusion from customers around the different approaches to capturing contract data such as dates, names, terms, values, etc. After all, leveraging data is one of the biggest drivers for contract management software. Let’s dig into the differences between the three most common approaches – folder/file structures, tagging, and a central repository of structured data. Folder/file structures have been around forever and we’ve all had to use them at one point or another. The biggest problem with them is trying to locate a specific document or file you need at any given time. I can’t even begin to imagine the number of times I’ve lost track of a single file just among my own personal data structure. Now can you imagine trying to do that with a 100, 1,000, 10,000, or more contracts? Let alone trying to audit and identify key details inside any of those files? Typically, businesses using this approach must use another disjointed solution such as a spreadsheet to try and maintain as many key details as possible. However, this won’t help when you need to identify specific language inside your agreements themselves since there is no link from that spreadsheet to the related agreement. Now you are having to leverage multiple tools or directories to try and do something which should be very simple but isn’t. Tagging is a newer trend to come to the contract management world. It adds another layer of being able to add text tags to help identify what type of contract record you are dealing with. For example, you could tag all your documents to help identify the type of contract such as NDA, MSA, etc. However, it’s a manual process that’s prone to a lot of human error. Is everyone tagging documents the same way? Do we have multiple tags being used for similar items? It also still typically deals with a folder/file structure hierarchy, just now in an online repository of document-centric tags as compared to record-level data. While this is an improvement in some ways from a straight folder/file structure, it still has problems when you look at managing your agreements and processes in the longer term. For example, how can you run meaningful reports and analytics on tagged documents, more so when tags are not required? 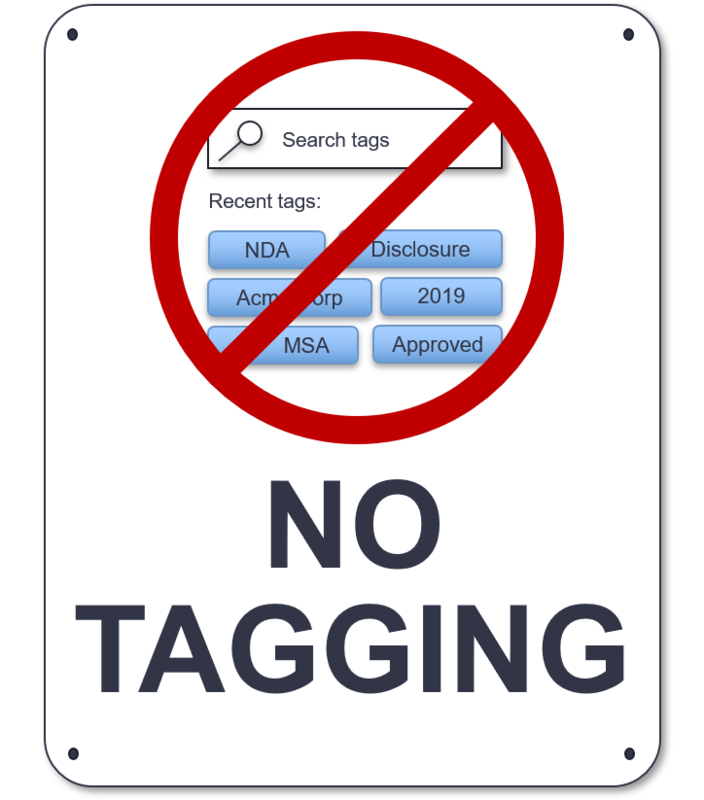 In fact, tags may give you less control and reporting than what you might be able to glean from an excel file as you are just running queries against the documents rather than important data points. While it gives you a better ability to find a specific document, it doesn’t help you truly manage and improve your CLM process. This last approach should be the end goal for any business no matter the size, especially if you want to manage your contracts in a way that saves time and gives you faith in your information. It all starts with having true relationships between contracts, organizations, contacts, and document records –each with all with the relevant information or metadata your business needs to be able to track and report on. Knowing that with a quick search, or a few clicks you will be able to see everything you need about a specific contract record. Where on the fly you could tell your boss every MSA, expiring in 90 days, over a certain dollar value, or any other relevant data with little or no effort. The ability to see the true history of your agreements, amendments, and relevant documents –all within a single central location. This type of solution makes it extremely consistent to capture, search, filter and report on any contract data. The one key point I hope you walk away with are the benefits of having a true structured data repository for your contract records. This is what Contract Logix strives to bring every customer and a goal we hope each client will see the benefits of leveraging long-term. It’s all about helping you find what you need quickly, managing your process more smoothly, and allowing you to spend more time where you really need to. You can’t accomplish that with tagging. If you want to learn more, please feel free to get a live demo. Justin Perkins is a Solutions Engineer with Contract Logix. For the past 3 years, he’s worked with hundreds of customers to help them find the right CLM solution to digitize their contract lifecycle management processes. In addition to helping people solve their CLM pain points, Justin is huge fan of going to see the next big movie in theaters or just spending time experimenting with cooking meals for families and friends at home. Skills/Knowledge: Contract Lifecycle Management, Salesforce Administration, NetSuite Administration, CRM, ERP, E-Commerce.